Look and you see a dancer spinning on pointed ballet shoes. Listen and you hear a piano and violins quietly playing in sync with her movements. Tilt up to see lights shining down on you. Spin around to find a empty concert hall with rows upon rows of open seats. If you said on a stage during the rehearsal of a ballet performance—though a good guess!—you’d be mistaken. You’re at home, holding your phone, watching a 360-degree video. Specifically, you’re watching a 360-degree video produced by StoryUp, a Missouri-based virtual and augment reality media company. So what accounts for the success of video as a marketing medium? The answer is storytelling. When it comes to digital marketing, that’s really what it’s all about—stories. Not percentages and pie charts and bar graphs. Though important, the numbers are just aiming to quantify engagement in the stories we’re telling. To see the people we’ve touched, action we’ve motivated and change we’ve sparked. If the goal is engagement and the method is storytelling, the next step up from flat frame video is taking that video 360 degrees, to the cutting edge marketing media. 360-degree videos use a special set of cameras to record all 360 degrees of a scene simultaneously, which means that while a video is playing you can choose which angle you want to view it from. With comprehensive integration into Facebook News Feed, tilting your phone or scrolling your screen allows you to spin around, look up and down, as if you’re actually there in person—a truly immersive experience… trumped only by putting on a VR headset. But, how does traditional, flat frame video stack up to 360-degree video in terms of engagement? Magnifyre partnered with StoryUp to run a test comparing engagement with traditional, flat frame video with 360-degree video. 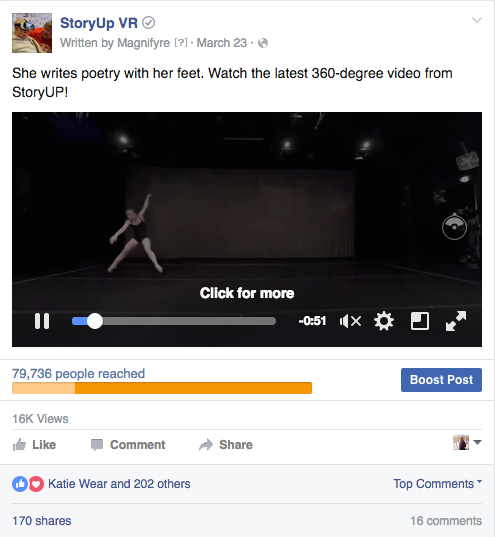 We compared both versions of a video featuring a single ballet dancer on a stage, promoted to dancers between 18-65 on Facebook. The ads were optimized for video views. The Cost per 1,000 impressions (CPM) is significantly lower for 360-degree video ($4.20 vs. $1.74). The Click Thru Rate (CTR) was significantly higher for 360-degree video (4.51% vs. 0.56%) despite the fact that the thumbnail image and copy was identical for each. Average percentage viewed was 28.81% higher with 360-degree video, and double the viewers watched the video to 100%. The data suggests that 360-video engages viewers on a level that not only encourages them to click, but to watch more of it. Furthermore, the 360-degree video received 170 shares. In a world where brands and stories are fighting for attention, this is no small difference. The data indicates a boost in user engagement and it’s not difficult to see why. The flat frame video allowed viewers to see the dancer’s performance from a static angle, while the 360-degree version placed viewers on stage with the dancer, allowing them to pan the concert hall, look up at the stage lights, and down toward the audience seats. The 360 video gives power to the viewer. It makes them a part of the story. Charities and causes are using 360 video to tell their stories and bring a new perspective to the work they’re doing around the globe. StoryUp has used the dynamic media to bring audiences to tents where homeless veterans sleep, inside the view of a stroke patient or to villages in Zambia where people have to crawl on the ground due to lack of mobility. When it comes to connecting audiences to a cause, 360-degree video is the closest thing to placing the viewer in the subject’s shoes, short of going there themselves. So as you pursue your digital marketing goals, think like storyteller. Immerse, engage, and connect with your audiences by telling your story in 360 degrees. Want to learn more about how you can use immersive storytelling to reach new and engaged audiences on Facebook? Contact Magnifyre today.